I used 1 cake mix. And 2 oval cake pans. I found this hollow chocolate duck and couldn't resist. So I put him in 'water' and 'grass' around the water. Iced the sides white and put green vines and leaves. 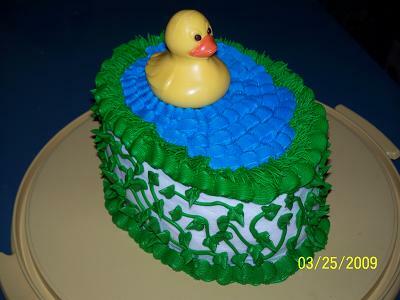 The duck would be cute on a baby shower cake as well, or an Easter cake.